That’s a car on the G.W. Parkway Path. Yes, the path, not the Parkway. Last Tuesday a friend and I were riding bikes south on the path. We were 3 miles or so south of the Wilson Bridge when we came upon an older lady driving a BMW on the path itself. How she maneuvered that full sized car over some of the path sized bridges I will never know. She must be a pretty good driver! A tad confused about roads, but she sure as heck knew where the sides of that car were. My friend and I, and another fellow who peddled up behind us, stopped her, informed her that cars were strictly not allowed on the path, and each of us offered to turn her car around for her. She turned the car around herself, and as she drove away I said, “Dang it! 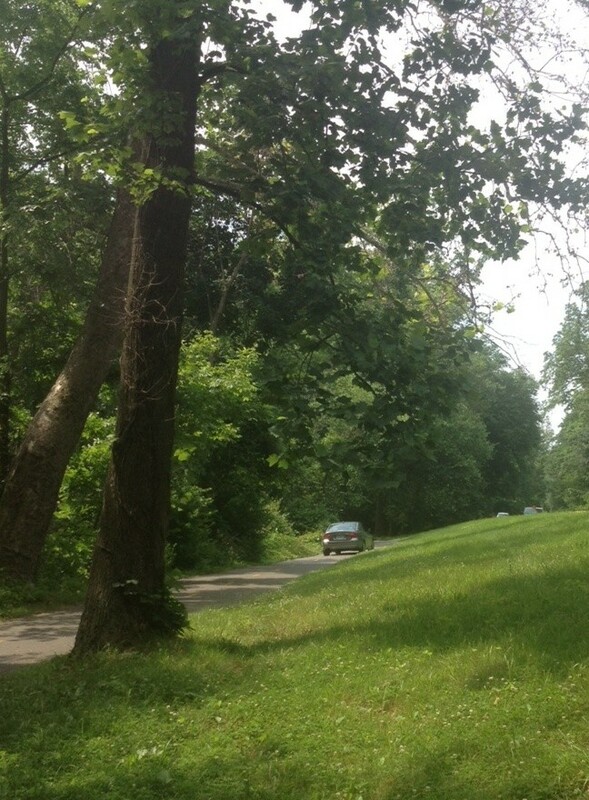 I shoulda got a pic of that!” My friend, Kim, whipped out her phone and caught this last glimpse of the car on the path. I often wonder if I should wear a bike helmet. I typically don’t bike any faster than a jogger jogs, so I sometimes think a helmet is overkill. However, I also feel like I am safe from cars when I am on bike paths - so much for that false sense of security. Plus I am usually more worried that I will fall on my face and break my teeth than I am worried about cracking my skull. Heck, my skull will heal, broken teeth don’t. So now I am tempted to wear both a bike helmet and a mouth guard, even while biking where cars are, “not allowed”.